Pigment, known as melanin is produced in the melanocyte cells in our body, these are found in the basal layer of the epidermis. It is melanin that determines the ‘colour’ of our skin. The greater the amount of ‘eumelanin’, the darker the skin pigment. 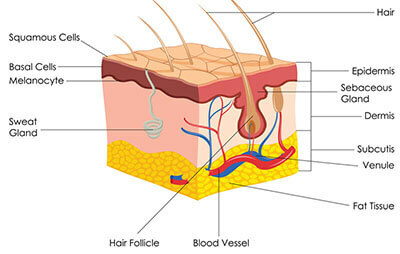 The greater amount of ‘pheomelanin’, the lighter the skin. In the case of someone with albinism, one would find very little, or no melanin within the melanocyte cells. Treatments currently available to reduce or remove unwanted moles are mostly non-invasive, meaning that recovery time is minimal and pain intensity is low. This article, written by Dr Ilankovan, looks into the history of upper face rejuvenation and what the proposed positive effects are. "I knew the moment I met you that you understood my concerns almost without me saying anything. I am so delighted with the result. I have spent so many years being self conscious and hating my nose. Not only are you a fantastically skilled surgeon, you are a true artist. I am honoured to have been treated by such an esteemed and gifted surgeon. You have changed by life, and thank you from the bottom of my heart”.